Episode 28 – Adventure with a mission! 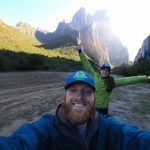 This month’s episode brings us an interview with the founders of Sierra Madre Research, a hammock design company with some interesting designs for their hammocks. Richard and Juli Rhett tell Mark and Jonathan about their company, some of their interesting designs, and how they got into hammock camping as an avocation and an important part of their personal mission – helping others get access to clean water. Finally, we get to learn a little bit about what happened to get Juli and Richard onto the set of Shark Tank. After the interview, Jonathan and Mark discuss the possibility that social media may be driving the overuse of our trails, and stand on a soapbox about LNT. Sorry about that, listeners…. Check our facebook page on Saturday, January 13th at https://facebook.com/hyohpodcast to see if we have enough bandwidth for a live podcast on Sunday.